100% of the vegetation has been removed by the Koi and grass carp in the 1/2 acre pond. I made these plant cages to submerge and seed with plants inside. I am planning on planting eel grass I have started in pots. I am also hoping to get lily pads started in the wide shorter ones. The idea is if the roots and sprouts are protected, the pads will make it through the mesh and float on the surface. 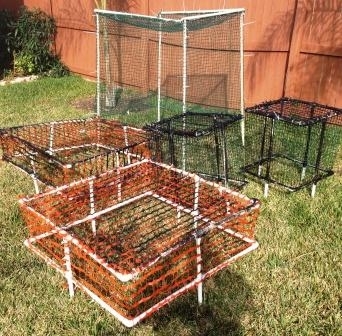 Has any one had success making plant cages to protect some plants in a pond. Any feed back would be appreciated. What are your planting depths? Any protective cages that I have previously encountered always extended from the bottom of the pond to the surface of the water, and these were for backyard decorative ponds that are rarely over 3 feet deep. To achieve satisfactory growth, the plants should be planted directly in the pond, not left in pots. I would say that planting in the pond bottom vs. pots depends on one's goals. I have seen beautiul waterlillies of many varieties grown in pots within larger ponds. The owner of the pond that I am refering to does not want the lillies to get out of control so he keeps them in pots and transplants as needed. I personally like a more self-sustaining system, so all my plants are planted in the pond bottom. 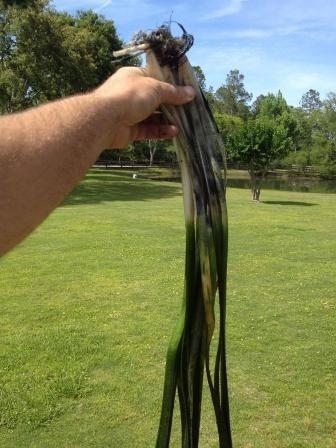 If I had a pond denuded of vegetation, I would get the grass carp out of the pond. Yes, planting them right in the pond floor. The koi rip up the roots too, so as long as the lilies and eel grass do well in the protected area i am fine with that. Don't want the plants to take over. I can adjust as I see how they do in the cages. I am wonderingif any one had done somthing similar and how it worked out or any pit falls to watch out for. I am also assuming have a couple oasis of plants would be better than having no vegetation at all for the general health of the pond and give insects, baby fish etc a place to hide. That's what I thought, should on the water in the next few weeks. I'll give an update layer in the spring on how any plants might be doing. Bobby, great approach! Suggestion is, if you want to protect the plants, rather than capping the upper area, just protect the plants from the bottom, and raise above the surface by 12 inches (just in case of flooding or introduction of high water during rains. It also allow the plants to grow toward the surface without restriction. Decrease your mesh size from a large 1" to 2" square gap down to 1/8" to 1/2". Small fish will actively come in to feed. One they're too big go come and and out, they'll grow inside that isolated area, and again, destroy your plant's potting area. You already cover the deep implanting of the edging to prevent the fish from sneaking through from below. make sure at least 4" of the netting at the bottom go past the loose soil. When fishes get desperate, they do crazy things. Carps and koi will jump to get to the food sources when something is obstructing their way. Best to create the top as a pyramid shape rather than a flat top. This way, it allow the fish to roll off rather than trapped at the top. * Knowledge and experience yield wisdom. Sharing wisdom expand the generations with crucial knowledge. Unshared wisdom is worth nothing more than rotting manure. Bobby - good update. Keep us informed on the growth. 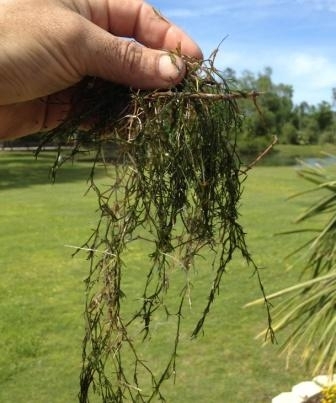 Do you know what type or strain of eel grass that you planted? 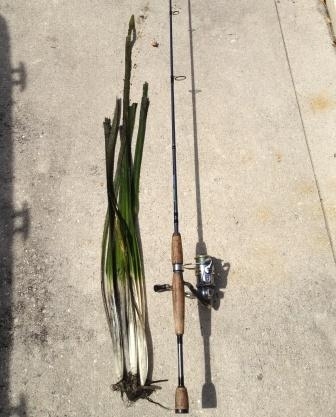 I think, I got it from the st johns river in north east florida around colle cove, st johns county. My plant cages seem to be helping. 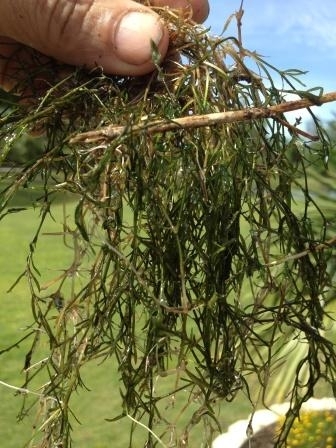 The eel grass has taken hold and doing great inside the cages and is trimmed neatly across the top from being nibbled on by fish. One cage that was a failed Lilly pad transplant was full of this grass and seemed to be a real magnet for the little CNBG. If it was not for the cages protecting the plants the pond would have zero plants. Its nice to not have FA or vegitation overgrowth issue. These cages seem to offer a few undwater oasis of plants for bugs small fish etc. any one have an idea what the grass studd is, it was only growing about 6 inches tall from the bottom nice and thick like a lawn almost.